Zeph Thomas. PIC: Steve Ambler. Brighouse Town exited the West Riding County Cup after losing 5-4 on penalties to rivals Ossett United on Tuesday night. The home side had missed two penalties in normal time through Gibraltar international Adam Priestley as the game finished scoreless. Zeph Thomas missed the decisive penalty in the shootout as he saw his effort saved by Ossett keeper Brett Souter. James Burke scored the winning spotkick to send the host’s through. Both sides were pretty well matched in the opening exchanges. Town controlled the first 45 minutes before two changes from Ossett at the interval saw the home side come into the game. Brighouse looked to work the ball wide from the back but didn’t do much to threaten Souter’s goal. Ossett were struggling to hit their stride with most of their passes into the final third going astray. The away side had a superb chance to go ahead when Thomas’s deflected cross flashed across the face of goal but Aaron Martin was unable to make contact. Moments later, United’s Souter pulled off a fantastic double save to keep the scores level. Thomas, causing more problems on the left, got in behind but his shot was kept out by a strong arm from Souter before the United stopper blocked the rebound. Brighouse kept creating the better chances and fashioned their best opportunity when Martin slid the ball in to Oscar Seth. But the Town midfielder hesitated before firing over under a challenge. Despite being under pressure for the latter part of the half, Ossett United should have taken the lead. After a foul in the area the referee pointed to the penalty spot but Adam Priestley’s spotkick was saved by Matthew Smith before the rebound was hacked away. Manager Andy Welsh opted to make two changes at the break with Aidan Chippendale and Marcus Day replacing Nicky Boshell and Alex McQuade. United enjoyed the better of the second half but were unable to make their dominance count. Priestley missed his second penalty of the game as he blasted his effort over the bar. Tom Greaves had done brilliantly to get past two defenders before being pushed in the back by Kurt Harris. Brighouse still looked dangerous on the counter as Adam Porritt was forced to head the ball away from under his own crossbar. Thomas had an effort from the edge of the area well saved by Souter as neither side broke the deadlock. 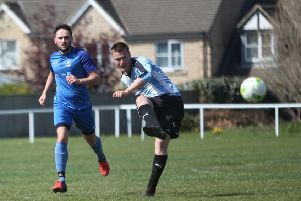 Ossett pressed for a winner in the final moments but the game went to penalties before United advanced as they converted all five spot kicks.